Few can agree on the world's greatest ski resort, but most would have Aspen in their top five, like St Moritz, just because of its reputation. Apart from being a remarkable resort, dripping with wealth, Aspen has great skiing over four mountains, a world-class lift system and more alternative things to do (underground loco pulled silver mine tours for example ) than anywhere else. Aspen Highlands, the last to comre under the joint aspen ownership, offers one of the biggest verticals in North America (Snowmass has the biggest in the US), and one of the world's newst lift systems. A base village is currently undrer construction here. Both it and Aspen Mountain have plenty of expert terrain. Beginners have their own mountain - Tiehack. Snowmass Village is a semi-autonomous resort, 12 miles from Aspen valley. 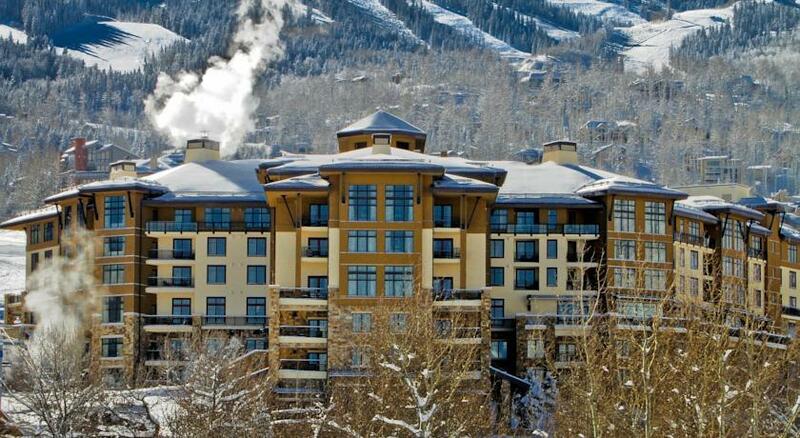 It has immediate access to the most black and double black diamond skiing in area and offers 95% slopeside lodging. When will it snow in Aspen? The next notable snow forecast for Aspen is 4cm2in, expected on 30 April, with around 5cm2in forecast over the next 7 days. The American Ski Resort of Aspen has direct access to 200 marked pistes, served by a total of 8 ski lifts. The ski resort itself is at 2,420m7,940ft, so skiing or boarding back to the resort is usually possible. With ski lifts as high as 3,490m11,450ft, skiing and snowboarding is assured throughout the season. Aspen has established itself over many years as one of the world's leading ski resorts, with a reputation for superb skiing for all standards and for being a lively and diverse ski town. Although it also has a deserved reputation for being one of the few winter sports destinations for the world's rich and super-rich, the Aspen Skiing Company, which owns all four of Aspen's ski areas, is keen to point out that it's possible to ski Aspen on a budget. About two thirds of Aspen's visitor beds are located in Aspen itself, whilst most of the remainder are 12 miles (20km) down the road at Snowmass, where 95% of the accommodation is slope-side. There is a third development, the newest, at Aspen Highlands. Given its status, it is not surprising that Aspen tends to be in the ski world headlines for one reason or another every year. In 1997/'98 it was for taking the Biggest Lift-served Skiable Vertical in the US crown from Big Sky in Montana, after Aspen added a high altitude surface lift to open up the powder bowls of the Cirque, high above Snowmass. Aspen's fame actually dates back to a time before skiing, although it was only settled as recently as the 1880s, having originally been a summer destination of the Ute Indians. Prospectors arrived in 1879 and within 15 years the town was the largest silver mining district in America, producing a sixth of the national and a sixteenth of the world's silver needs. It had hydro-electrically powered mines, a primitive cable car /cable tram for miners and ore, a railroad link, an opera house, a population of 12000 and six newspapers. Mining decreased at the turn of the century but Aspen was resurrected as a ski resort in the mid 1940s. The most difficult run is the 'Go-Go Gully, Highland Bowl'. Aspen has four mountains, not linked by ski lifts, which together offer a vast range of skiing for all standards. There is a complimentary shuttle service from 8 a.m. - 5 p.m. for skiers and snowboarders. Beginners and those looking for quieter, gentler slopes tend to start at Buttermilk, a few miles (5 km) out of town. Those wanting a huge terrain with something for everyone will head for Snowmass 11 miles (18 km) away, whilst those searching out advanced and expert level thrills and excitement go straight for Aspen Mountain, or Aspen Highlands three miles (5 km) distant. Access to intermediate level terrain on Aspen mountain was improved with the installation of the United State's first high-speed detachable double chair, replacing the original Ruthie's chair, and reducing uphill transit time from 11 minutes to five. For the more advanced skiers looking for extra excitement, there are guided off-piste tours at Aspen Highlands and Snowmass, and a popular Speed Skiing Course also at Snowmass, where participants often clock up 65mph (105kph). The lift-served Cirque powder skiing above the treeline at Snowmass is also a popular option (open around 60 - 75 days per season, according to snow conditions), as is an Aspen Mountain Powder tour. This all-day tour is not for the faint-of-finance however, coming in at $225, including gourmet lunch. A huge range of ski and snowboard school classes are available through the thousand-plus teacher strong Ski and Snowboard Schools of Aspen. One of the most novel is the On-Mountain Performance Centre where all levels of skiers can use on and off snow biomechanical analyses of body movement and equipment ...to unlock each skier's true potential. Aspen was famous for not allowing boarders on to its flagship Ajax mountain (the main slopes above the town itself, although there were permitted at the other three mountain areas) until the turn of the century. It has now gone to the other extreme and built itself a reputation as a boarding mecca with Buttermilk ski area one huge snow park and a venue for the Winter X Games. We don't currently have confirmed season dates for Aspen. NOTE:- Lift and Piste openings are always subject to Snow Conditions in Aspen. Aspen is able to make snow, with 490 snow cannons. The eight ski lifts of Aspen are able to uplift 24,000 skiers and snowboarders every hour. Aspen is in the American Rockies in Pitkin, Colorado, United States. The nearest airports to Aspen are Aspen, Vail/Eagle and Grand Junction. There are four airports within three hours drive. Aspen is just one hours drive away, in good driving conditions, so you can be on the piste quickly. As you would expect, there is a wide variety of nightlife on offer at Aspen. Cultural, shopping and dining options are described in the relevant sections of this text. Popular night spots include The Rock, open every night, live music at Hotel Jerome and free country dancing lessons at Shooter's Saloon. Budget friendly nightlife for over 21s includes the U-Call-It Night, a '70s night at The Tippler and the infamous 'Pitcher-of-beer-and-five-shots' deal available after 11pm at Little Annie's (open until 1am) Ironically enough, given Aspen's reputation, this must be about the cheapest drinks deal available in any western ski resort. Want to Know when it Snows in Aspen? 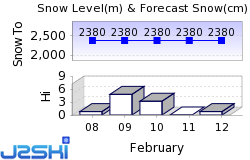 Click above to get Snow Reports by e-Mail for Aspen. By doing so, you agree to Our Rules. Other popular Ski Areas near Aspen. Ski Hire Shops in Aspen. For current snow conditions, see our Aspen Snow Report. Want to ask about skiing and snowboarding in Aspen? Or contact Aspen Tourist Office. Note :- The information on J2Ski concerning Aspen, where not clearly factual, is opinion only and is neither definitive or exhaustive. Warning :- Snow Sports are Dangerous! Skiing, snowboarding and all winter sports involve risk of serious injury or death. You MUST confirm all information, especially snow and weather conditions, in Aspen before you ski or board. You participate at your own risk.